Just what you need to complete your very own fairy tale! You have the prince, you'll have the castle, and soon to come, the happily ever after! This bright-white, Z-fold invitation features a majestic castle design. 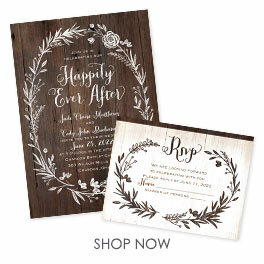 The front displays the words "Dreams do come true" and "Happily Ever After" on the right panel in the same ink color you choose for your invitation wording in the center. Inner and outer envelopes are included. Love! Love ! Love! I so recommend these invitations 💯 . I had these done for me fairy tale wedding. So beautiful! So elegant! Awesome quality . If any issues customer service fixed it at once & were so nice & helpful. Will order again & will recommend. I love these invitations! They came just on time! I went with the gold color on first page with the castle and the last page that writes "happy every after". The middle part i chose a purple color. The gold was sparky and beautiful. They come with a small envelop that you put into a bigger envelop which i am still confused on why this is but none the less it is nice to have that double envelop! Very good quality and oh-so crisp writing. It will be easy for everyone to be able to read. I had order invitation before but I postponed my wedding. I found the perfect venue at a castle and saw these invitations. I received them yesterday but did not open them until this morning. I was so happy when I saw them. The invitations were better than I expected. Would definitely recommend these invitations. The service I have recieved with Ann's Bridal Bargains is expectional. Great job!! We received these invitations and we were very impressed. I couldn't stop touching it. They were so much better than expected. We got the dark blue ink and we really feel that it reflected us more so. I didn't care for the really white paper (other paper options would have been nice, in my opinion). My fiance loved the crisp white though, so we're happy. I was worried that the price would mean the paper wouldn't be a good weight and quality, I was happily wrong. The invitations for my daughter's wedding couldn't have come out any better. They are lovely and made her cry. The quality was better than I expected and I am very pleased that she found your site. The delivery was fast as well. These invitations were inexpensive, easy to assemble and looked exactly as they were pictured. We couldn't be happier with this invitation. Inside we are both still kids and this unique and affordable solution helped our dreams come true. Simple, elegant, fun. This was exactly what we wanted. They were simple and elegant. Just what my daughter and son in law to be wanted. Very enchanting for their theme of fairy tale weddings. The royal blue was close to purple but they were so beautiful I ended up liking it more then the blue I selected. These are high quality and simply georgious. I loved the invitations, they fit great for my fairytale themed wedding. They were very nice! These invites are PERFECT for my fairy tale themed wedding. I love everything about them!! Couldn't have found a better invite for a better price! I used these for my wedding. They were the perfect addition to my princess/ fariy tale wedding. After being able to set up and SEE this invitation on-line, this lived exactly up to what we expected. We love the design and have ordered all the correlated items. Beautiful!